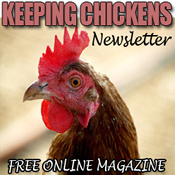 Raising chickens is one of the first steps to self sufficiency that many people take. As well as providing much enjoyment and amusement one of the many benefits keeping chickens is the eggs that they give us. 1. Egg Chicken Breeds. The most noteworthy characteristics of the egg breeds are : Small size, active and nervous temperament, early maturity, non-broodiness, good foraging habits, and sensitiveness to cold. The principal representatives of the egg breeds are Leghorn, Minorca, Spanish, Andalusian and Hamburg. All except the Hamburg, belong to the Mediterranean class. 2. Meat breeds. Among the characteristics of the meat breeds may be mentioned large size, gentleness in disposition, slowness in movement, poor foraging proclivities, as a rule poor laying qualities, late maturity and persistent broodiness. Brahmas, Cochins, and Langshans are the principal meat breeds. 3. General-purpose breeds. These are of medium size, are good table birds, fair layers, less active than the egg breeds, but more so than the meat breeds, and are good sitters and mothers. Plymouth Rocks, Wyandottes, and Rhode Island Reds belong to this class. 4. Fancy breeds. 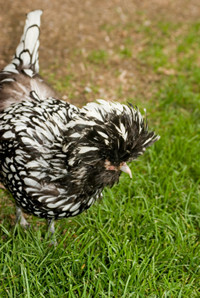 Bantams of various varieties ; Polish and Silkies come under this head, and are raised chiefly for some peculiarity of form or feather without regard to useful qualities. The above classification of chicken breeds is a loose one, but does give a general idea of what to look for when first thinking of raising chickens. When choosing which chicken breed is best for your coop there is more to consider than simply which chicken will lay the most eggs. If you live in a very cold climate, a bantam breed for instance may not be the easiest to keep and those with large combs can be prone to getting frostbite and so more care when insulating and ventilating the chicken coop will be required.